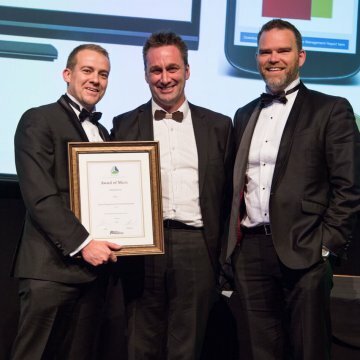 ENGEO celebrated being recognised with a merit achievement at the 2018 ACENZ Innovate Awards of Excellence Gala Dinner, held in Hamilton on Friday 3rd August. This is the second year ENGEO has been recognised at the esteemed event, this year’s award was for a new software product for asbestos management. Building Materials Information System (BMIS) is a unique subscription based product designed to create asbestos management plans. Created by ENGEO’s new technology company, Entuitive, BMIS was developed after recognising a lack of suitable software in the market. BMIS not only develops asbestos management plans that comply with regulations but assists in managing additional regulatory requirements. The 2018 INNOVATE NZ awards are the premiere awards for projects in the professional engineering and consulting industry. Unique and highly regarded, the awards celebrate outstanding projects demonstrating a high level of technical expertise, innovation, complexity, and excellence in consulting work. Award categories include Merit, Silver and Gold.This is the 53rd year for the INNOVATE Awards which serves to acknowledge and honour innovative and exceptional consulting and engineering projects in New Zealand and Internationally. Over 300 people from around New Zealand attended the prestigious event. The INNOVATE Awards are a peak achievement compared to other industry awards as each of the projects are evaluated individually and assessed for the level of innovation and excellence judged to result in an outstanding outcome for a project or consulting service alone. The high level of project evaluation means there may be more than one award in any of the given categories or none given at all. A project will not be awarded a prize (being Merit, Silver, or Gold) for simply being a good project. The work, technology and service must go above and beyond what is considered standard operating procedure for the industry. It is this peer-reviewed, high standard of evaluation that credits the INNOVATE Awards above all others. Each year a panel of 25-35 judges evaluates all of the submissions, conducts client interviews and tours many of the project sites. This attention to detail accompanied by a thorough investigation by a panel of peers is what makes the INNOVATE NZ Awards of Excellence the pinnacle of industry achievement. For 2018, twenty-two projects were submitted ranging in disciplines from engineering management, electrical engineering, civil, environmental engineering, procurement services, consenting, data/analytical advisory, sustainability, structural, and more.